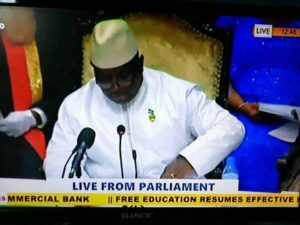 President Julius Maada Bio has, during the State Opening of the Fifth Parliament Thursday, May 10, made a commitment that his administration would repeal the obnoxious seditious libel law, while he encouraged the private sector to invest in the media across the country. “My administration will take immediate steps to repeal the seditious libel law, support the School of Journalism and other institutions to train journalists, encourage the private sector to invest in the media, provide budgetary subvention to Sierra Leone Association of Journalists, enhance the capacity of the Independent Media Commission to enforce the IMC Act and, review the legal and operational status of the Sierra Leone Broadcasting Corporation to make it a truly professional national broadcaster,” he said. He observed that the media and civil society have become the bedrock of modern governance and that in Sierra Leone they are in the forefront in holding state actors accountable. “In early 2000, government set up the Independent Media Commission (IMC) and charged it with the task of regulating and monitoring media institutions to ensure that they operate in a way that promotes the public good. However, the IMC has failed to enforce its own ethics and like most democratic institutions, it has not escaped political interference from past government,” he observed. He continued that in 2009, the Sierra Leone Broadcasting Service (SLBS) was transformed into a national broadcaster and renamed the Sierra Leone Broadcasting Corporation, adding that its mandate enjoins it to be impartial and to provide equal opportunities to all political parties. The seditious libel laws have been used by successive governments to intimidate and detain especially critical journalists by successive governments. Although former President Ernest Bai Koroma had promised to expunge the law while in opposition, he reneged on his promise during ten years of his administration. He told his audience in parliament that in order to ensure effective coordination of support for the programme, his government will establish a Multi-Partner Education for Development Basket Fund. He said a Technical Group (TG) on Education comprising professionals from the relevant ministries, departments and agencies and partners will be established to design the programme, coordinate and monitor the implementation and that the Technical Group will report to the High Level Inter-ministerial and Partners Group. President Bio noted that without qualified teachers, the Free Education Programme will not be fully implemented, hence his as part of his New Direction, government will raise the morale and productivity of teachers. “To this end, a Presidential Initiative for Teachers of which the initiative will ensure that matters relating to teachers are treated with utmost importance. Additionally, my administration will review and make functional the Teaching Service Commission, develop a special incentive scheme for Science and French teachers as well as teachers in remote areas and those in special needs institutions and introduce ‘THE BEST TEACHER’ Award Scheme for the most innovative and ingenious,” he said to thunderous applause. He promised that his government will provide free university education for three children of every school teacher with at least 10 years’ teaching experience. He said increasing the number of qualified teachers and ensuring fair distribution amongst districts would be critical for the successful implementation of the Free Education Programme. For the physically challenged, he said the Sierra Leone Peoples Party-led government will review and implement policies and laws relating to disability, especially making public facilities disability friendly, review and improve incentives for Teachers in Special Needs Institutions, provide free health care for the physically challenged and the aged, and also provide livelihood support to persons living with disability for economic empowerment. President Bio, 53, further observed that the young generation are yearning for new opportunities to interact with their peers in other countries and on a real-time basis and that social media has become the order of the day with increased demand on data bandwidth to respond to those demands. “My New Direction will ensure that communications services are improved to such an extent as to contribute significantly to the country’s communications development and at affordable cost to all. More specifically, my administration will de-politicize NATCOM to enable it carry out its functions efficiently and effectively, establish an electronic governance system to manage government business electronically, provide computers to all public libraries and promote training in use of computers in public libraries, schools and colleges, protect legal documents by establishment of digital storage centres at remote locations, develop IT infrastructure resilience by multiple back up services for all government documents in all ministries thereby ensuring health records, land records, etc. are secure, and enhance broadband access across the country, improving rural telecommunications and creating customer choice and affordability,” he said.